Location: In corner between road and wall near Turf Gate. 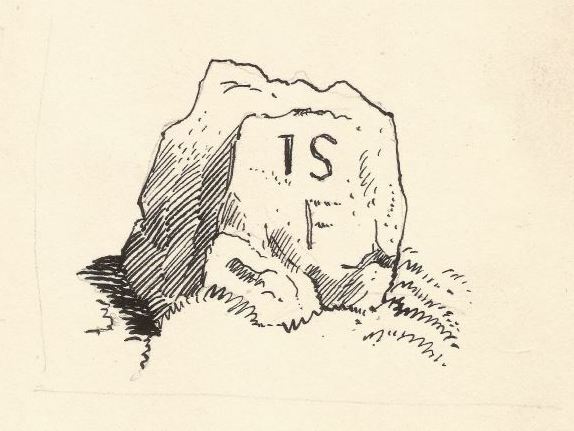 This is a prominent, large stone, which appears to have 'IS' carved in relatively small lettering on the southern side, with an 'F' below. The 'I' could be an 'J'. It appears to be coincident with the northern boundary of a lease held by J. Clayton & Co. (see Meer Stone 12), and may be the founder stone of an adjacent lease. This drawing was done by either Marmaduke Miller or Dan Binns, and was provided by Robin Miller via Chris Camm. A version of this page with a photograph of the stone may be found here.